Today in class, students described the Little Rock community's response to the integration of Central High School after the Supreme Court case Brown v. Board of Education. 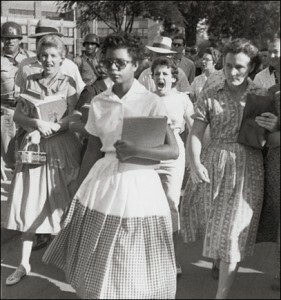 If you missed class today, you can listen to Elizabeth Eckford talk about her first day of school here. Homework - p. 40 - Complete the First Day of School Picture by writing what people might have been thinking or saying in the photograph. Then, analyze the image by answering the questions on the back!